According to analyst firm Sensor Tower, the debut of Season 5 in Fortnite has caused spending to spike 12% over the last 10 days on mobile. Meanwhile, Fortnite on consoles could be eating other franchises' lunch. Fortnite continues to be the hottest thing in the industry. How hot? Well, according to the folks at Sensor Tower, players have spent an incredible $150 million to date on the mobile version alone. And with the launch of Season 5, the battle royale title has seen a jump in spending over the last 10 days, averaging about $2 million in revenue per day on mobile. Sensor Tower reports that the increase in mobile Fortnite spending represents a 12% bump over the preceding 10 days, and when looking at a comparable period (the first 10 days of Season 4), spending is 19% higher than the $1.7 million players spent per day on average then. The highest total Fortnite has seen on mobile thus far came on July 13, when players spent around $3 million worldwide, Sensor Tower notes. Fortnite continues to gain momentum as it was only a month earlier that global spending had topped $100 million on mobile, and all without an Android version, too. Epic Games has still not officially given the Android version a release date, but it should be coming sometime this summer. PUBG Corp’s PlayerUnknown’s Battlegrounds was once the battle royale darling of the industry, and while the game is certainly still very popular, there's no denying that Fortnite has knocked it down the totem pole a bit. Despite having more than double the installs of Fortnite (and an Android version), PUBG hasn't had the same success in monetizing that player base. Epic Games' incredible success could be harming other big franchises in the business too, according to SuperData. While the general theory with explosive games like Fortnite is that it's not a zero sum game for the business, and hugely popular titles help to expand the pie, SuperData CEO Joost van Dreunen commented in an email that some of the data is indicating otherwise. "We’re now seeing signs of wallet-share shifting away from other top console franchises [thanks to Fornite]," he noted. 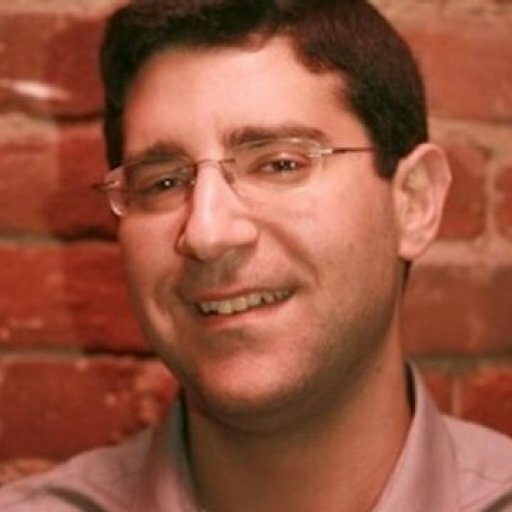 "The response from incumbent game companies has been one that attributes the title’s success to the phenomenon of ‘all boats going up’ and refuses to address the issue of market competition. There are signs, however, that warrant concern," he continued. "First, there exists considerable overlap between the consumer profile of a Fortnite player and that of people playing League of Legends, Counter-Strike: Global Offensive, and Overwatch. Audiences that like these titles generally also enjoy watching others play on streaming sites. In terms of online viewership, we’re observing the following: in Q2 total hours watched were up +59% for Fortnite, compared to League of Legends (-19%), CS:GO (-51%) and Overwatch (-16%). "Granted, some of these are highly dependent on tournaments and experience fluctuations around them. Esports-heavy titles draw much larger online audiences around and during events. But that does not negate the fact that a relative newcomer has successfully managed to push incumbent titles down the rankings. (This should be of particular interest to Activision Blizzard as it readies itself for the final of its first Overwatch League this week, which will serve as an important proofpoint for the first batch of sponsors that has invested in the contemporary esports advertising model.)" Fortnite on console has played a major role in boosting digital fortunes for the platform holders. SuperData pointed out that removing Fortnite from the picture actually would mean that digital console revenues would be down 6% in the second quarter (see chart below). That, by itself, doesn't mean that Fortnite is taking money away from other major console titles, but it does point to a significant challenge that the console publishers will have to contend with ASAP. "[Fortnite's] success is the result of macro-trends reshaping the industry, which, in turn, raises questions regarding the ‘digital readiness’ of incumbent titles and major franchises," van Dreunen stated. "Where previously no execs admitted to a loss in player activity or spending, it is increasingly clear that the newcomer is taking market share from existing titles, in addition to adding new players to the market. After a period of growth, the market is set to return to its usual zero-sum dynamic. 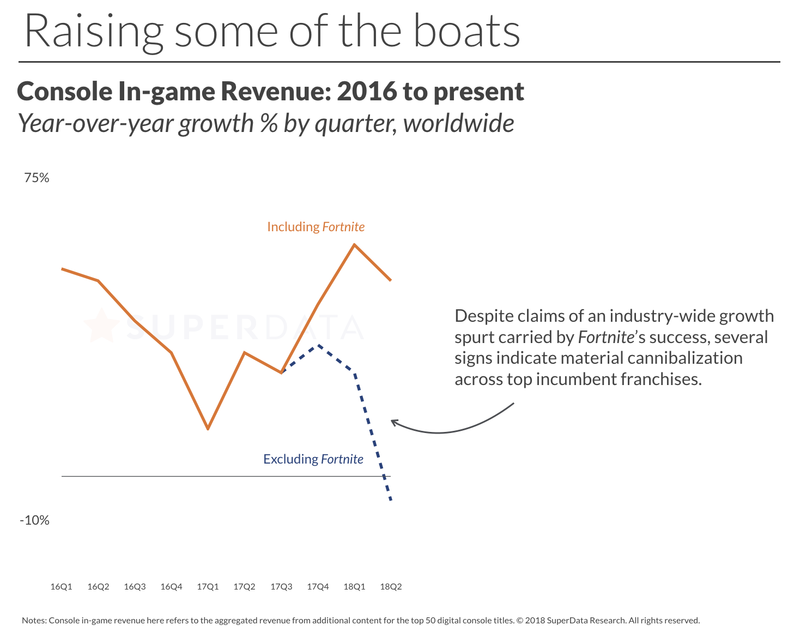 More so, instead of raising all the boats, several of the big tentpole titles are seeing a decline, suggesting that Fortnite has been obfuscating a broader market correction among incumbent game makers. 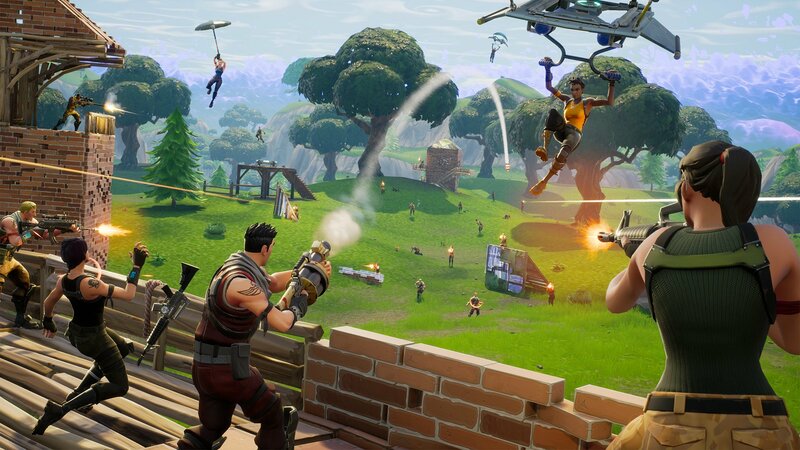 "In the run-up to this quarter’s earnings cycle, we expect publishers to provide more detail on this as they have different degrees of exposure to Fortnite’s success, especially those relying on revenue from multiplayer shooters and adjacent categories."